Use this procedure to search for a single endpoint or multiple endpoints through our dynamic and flexible search functionality. This proceedure also includes advanced searching options. Note that each field or drop-down menu allows you to filter on any combination of criteria. For example, if you want to search on the status type and the policy type, then you would populate those two fields only. For additional filtering capability, enter additional information. From the Endpoint Protection panel, click the Group Management tab. In the Hostename field, enter the name of the host. This is a free-form field, and is not case sensitive. From the Group drop-down menu, select the group in which you want to search. From the Policy drop-down menu, select the policy in which you want to search. Enter the active directory name. Browse to the location of the active directory. From the Keycode drop-down menu, select the keycode you want to search on. From the Platform drop-down menu, select the platform you want to search on. To include deactivated endpoints, select the Include Deactivated checkbox. To disinclude deactivated endpoints, do not select the Include Deactivated checkbox. When you're done, click the Submit button to filter the results. 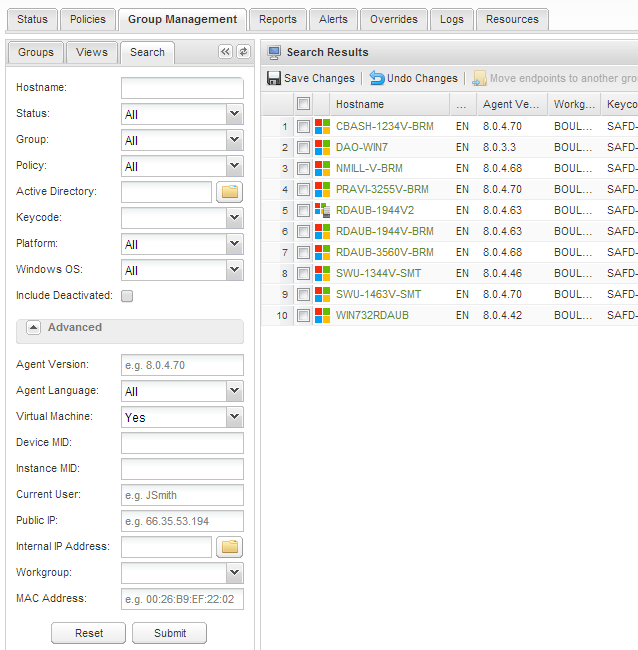 The Management Portal displays all endpoints matching the search criteria in the right panel. From the Endpoint Protection panel, click the Advanced Searchbutton in the upper right corner of the panel. 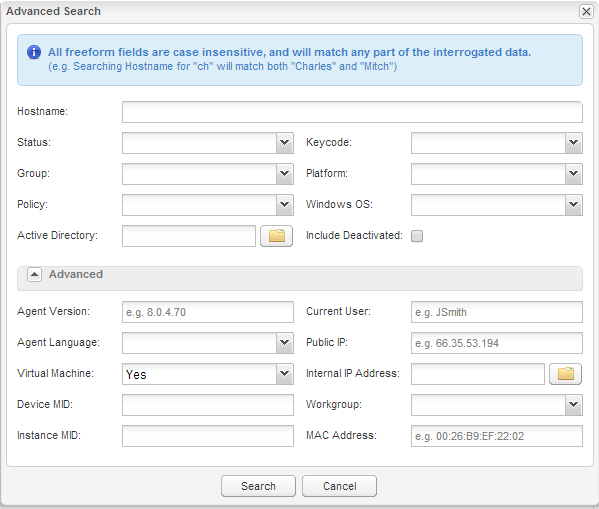 The Advanced Search panel displays. In the Agent version field, enter the agent number. This is a free-form field. From the Agent Language drop-down menu, select from a pre-set list of supported languages. Yes - This is the default. In the Device MID field, enter the unique Webroot-based identifier for the device. In the Instance MID field, enter the Webroot-based identifier for the instance. In the Current User field, enter the name of the current user. In the Public IP Address field, enter the public IP address. In the Internal IP Address field, enter the internal IP address. From the Workgroup drop-down menu, select from a pre-set list of available workgroups. In the MAC Address field, enter address of the MAC.